Owning a Pinto has pros and cons. On the one hand, your friends can always find you in a crowd at a horse show, but on the flip side you’re always working hard to keep the whites white, since as one friend says, “There’s no room for error. He’s either white or he’s dirty.” Having a Pinto is also rewarding if you’re a photographer. I don’t have to worry as much about overly light or dark backgrounds, blowing out his whites (he has browns and blacks to balance them unlike a gray horse), and both sides offer interesting patterns, colors and highlights. So, for this week’s A-Z Archive: P, I pulled out and edited an image of my Pinto that I’d skipped from last summer’s shoot. Even though it appears that I’m in a precarious situation, you can see he has his right ear cocked and is turning just in front of me. This challenge is a great way to revisit your files with a fresh look, and to maybe discover another favorite that was overlooked during the first time around. Thank you, Teresa. He does think he’s pretty amazing, too! Extraordinary picture!! Thanks for sharing. I love pintos but hadn’t ever thought about the work involved. Wow. Thanks! Well, even though I had two gray horses previously, I didn’t really think about it either. But if you keep up with the cleaning it’s not really so bad, and I think he enjoys his baths for the most part! Thank you! Finding a “P” in my archives was pretty easy! Beautiful photo! I love horses and used to ride them as a child. However, they kinda scare me now… Even if I know a horse is trained I still know they are so much more powerful than little ole me! Great revisit to an old image. Wonderful post! Thanks, Polly! They are powerful animals, and it’s something to always remember. Thankfully, this one is really kind, and I have a lot of trust in him. He had an excellent trainer to start him, which I think makes a huge difference. He is a good-natured horse who enjoys people. This is a terrific action shot Tricia!!! He is a beautiful creature!!! Thanks, David! He is fun to photograph. I think it’s probably a toss up between the number of images I take of him, my dog and my child each week! Wow! Wonderful shot … such power … such grace! Well done! Thank you, Stephen! I appreciate your comments! 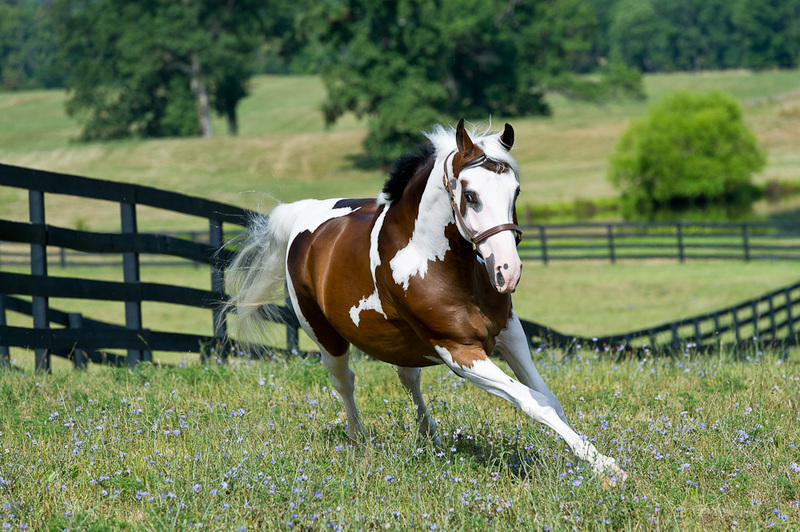 An amazing capture of a beautiful Pinto! I think his whites are wonderfully white. Thanks so much! I have to admit I did give him an extra bit of grooming before this photo shoot…Photoshop is a great tool for fixing blemishes, but I’m not quite that good yet! Wow! He’s a real beauty! Thanks so much! I am having fun with him! I love this photo! Horses are one of my favorite animals! Many thanks! I totally agree!